Wrigley, known as Beau, said he got into the industry mainly because of marijuana’s medical benefits. He said he’s tapping his experience with product distribution and brand-building to drive growth at Surterra. The cannabis company operates 10 medical dispensaries in Florida, including one in Miami Beach, and has a license to operate in the nascent Texas market. Wrigley, a billionaire whose great-grandfather founded Wrigley Co. in 1891, hasn’t yet invested in the burgeoning recreational marijuana market, which hit the East Coast recently in Massachusetts. But he’s watching closely as more states look to cash in on legal sales for adults of a drug that’s still considered illegal by the federal government. Dozens of states now allow medical marijuana use, and the FDA recently approved the first-ever cannabis-derived drug. Wrigley said the federal government will likely take more steps to loosen regulations. 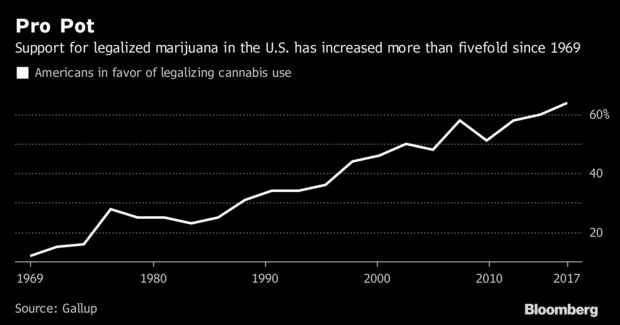 So far, the federal ban in the U.S. has mostly prevented banks and big institutional investors from taking part in the cannabis investment boom. As Canada prepares to legalize the drug for adult use in October, money is pouring across the border.